Synopsis: A teenage boy and his father move to his recently deceased mother’s hometown, where they encounter the ancient Native American cemetery with the power to raise the dead. Review: If you were to be browsing the roster of movies that have been made from the novels/novella/short stories of Stephen King, you’d notice the strange absence of a popular Hollywood occurrence: sequels. Something about King’s work has never leant itself well to a continuation of the story, mostly because the tales are largely self-contained within the singular telling. When the effort has been made to squeeze a little more money out of a popular title, you wind up with an icky franchise like the Children of the Corn saga, which has produced numerous sequels. (I stopped watching after the third one and stopped counting after the sixth). Then you have interesting misses like The Rage: Carrie 2 and this sequel to 1989’s Pet Sematary. I could actually see where Pet Sematary would be a valid property to revisit seeing that the ending of the first film was so open-ended and ambiguous. The evil at its center, an ancient Indian burial ground where dead things come back to life, was still open for business so what was stopping another unsuspecting family from moving into the neighborhood? With the slate wiped clean there was an opportunity for screenwriter Richard Outten (Journey 2: The Mysterious Island) and returning director Mary Lambert to expand on King’s original idea and go deeper into the origins of the cemetery. Unfortunately, this was 1992, when the goal of studios was to make their horror films as straightforward as possible. There’s little care for those pesky detailed complexities of backstory that would take time away from gore and bloodshed. So instead of a creative furthering of the material, Outten opts for a vague rehash of the original where someone learns the hard way that you shouldn’t re-bury dead things. After watching his B-movie star mother get electrocuted in a freak accident on the set of her latest flick, Jeff (Edward Furlong, A Home of Our Own) returns with his father Chase (Anthony Edwards, Top Gun) to her hometown of Ludlow, Maine to bury her and start a new life. Chase sets up shop as the town veterinarian while Jeff quickly runs afoul of the school bully (Jared Rushton) and befriends a lonely outcast (Jason McGuire) with a tyrannical stepfather (Clancy Brown, Thor: Ragnarok). When the stepfather accidentally kills his friends dog, Jeff is introduced to the local pet sematary and the dark magic it holds. Everyone in town knows what happened to the Creed family just three years earlier…and now Jeff is standing in the same location where the dead can walk. Like the wiley cat in the first film, the once docile dog returns as an aggressive pup and causes all sorts of trouble that lead Jeff and Justin down a morally dangerous path. As they try to undo their dirty deed and as Chase learns more about what his son has been up to, the movie feels like it shows its hand far too early on. The big reveal on the ultimate power of the burial ground in the original movie was kept for the last twenty minutes or so but here you have someone resurrected about 45 minutes in and that person becomes almost an almost comedic figure, intentional or not. Though they are supposed to be menacing, one-liners and a strangely goofy stare are clearly meant to put this character in the Freddy Krueger territory as someone who might kill you but also might just as well make you sit down and listen to their comedy routine first too. Lambert actually succeeds well in the first half of the movie, starting with the creepy opening on the movie within a movie. She’s not working with A-list actors here and this is another opportunity to wonder why the screechy Furlong was ever considered a commodity in Hollywood. As the movie devolves into its expected violent end it never brings any scares along with it – and that starts to get mighty frustrating because you want something more to be happening. I appreciated Lambert opted to include scenes with some sincerity in them, such as when McGuire is mourning the loss of his dog but then they are overshadowed with lame pseudo-terror sequences that feel imposed upon her by the studio. The ending is especially problematic and bombastic, feeling like it was made by another filmmaker entirely. 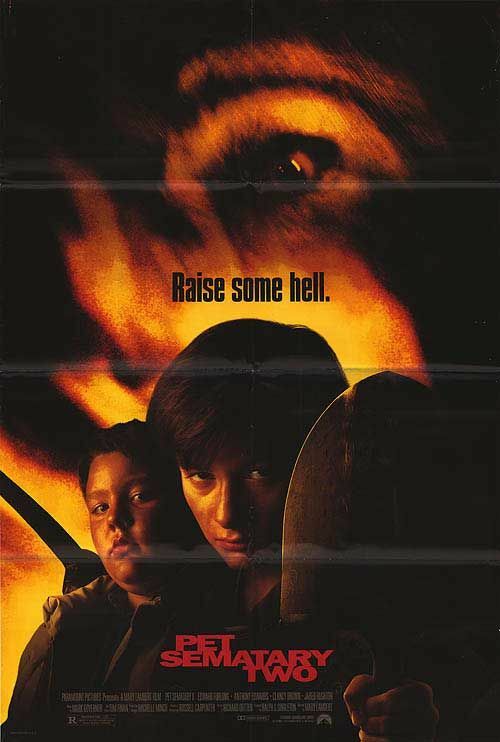 Not surprisingly, Pet Sematary Two failed to dig up the same kind of business its predecessor did and it’s largely because no one bothered to come up with something interesting for audiences. Instead of giving us just another story of death, burial, resurrection, and violence why not go back and show us a little more about its origin? I’m sure everyone made a nice buck off of their time spent on the project…but it effectively killed any chance of a third film or more. And this is one that could have, in my opinion, had a few more sequels up its rotting sleeve.